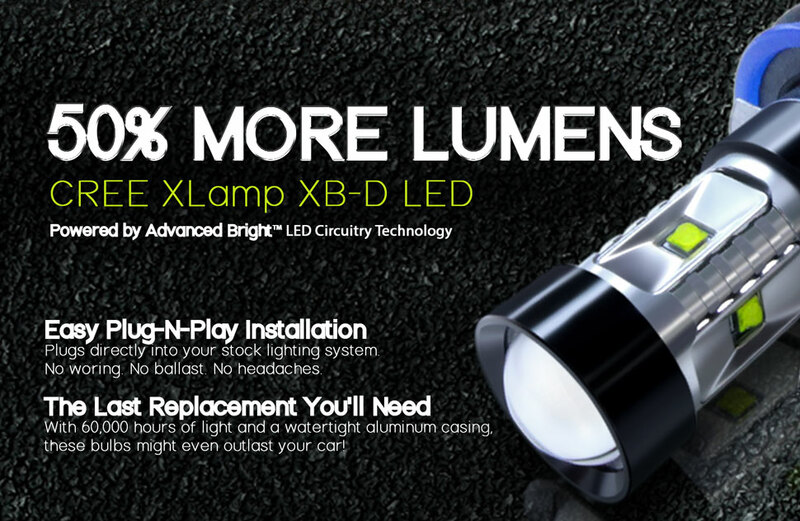 Our newly redesigned CREE V2 Series: LED Fog lights use even more of CREE's tried and true XLamp XB-D LEDs than our previous generation. These extremely bright LEDs are commonly found on high powered flashlights. Each of our fog light bulbs are stacked with multiple XB-D LEDs resulting in a noticeable increase in light density and light distance. These bulbs maintain our energy efficiency and heat dissipation goals that we strived for in the original series. These bulbs are great for converting fog lights into DRL fog lights. To increase light distance, we stacked two XB-D LEDs on the top of the bulb right under our optical projector lens. This refocuses all the light from the two LEDs into a highly dense beam that increases light distance over previous models. To match your fog lamp's natural beam pattern, we've outfitted an XB-D LED on each of the four sides of the bulb. These LEDs splash your fog lamp reflector housings with 115° of light which is then projected onto the road. 1050 Lumens per bulb, that's 50% more Lumens than the original CREE Series: LED Foglights and over 6-times brighter than our brightest Plasma Series. Tough aluminum bulb will not shatter or crack. Powered by Advanced Bright™ LED Circuitry Technology. Engineered for DRL fog light conversions. Extended lifecycle beyond 60,000 hours. Cost savings from future replacement halogen bulbs.